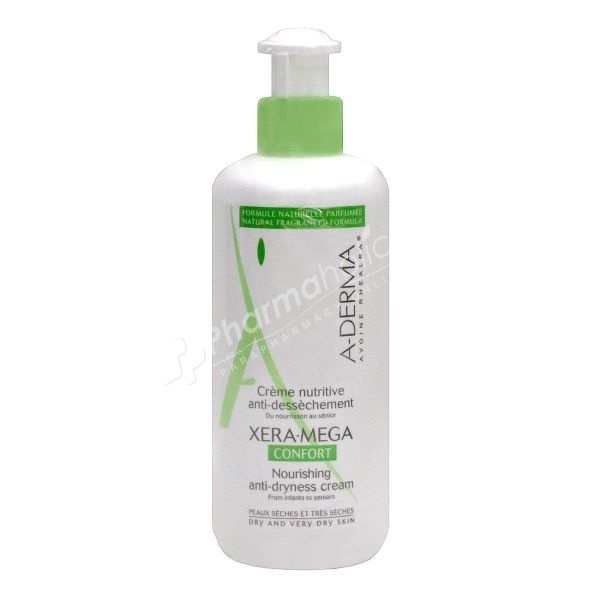 Aderma Xera-Mega Nourishing Anti-Dryness Cream natural fragranced formula allows to nourish dry and very dry skins of the whole family. Enriched in Rhealba Oat, the comfort cream is ideal to provide suppleness, comfort and softness to the skin from the first application. Its fluid and mild texture is very pleasant to apply. Hypoallergenic. Created to minimize risks of allergic reactions. Apply once a day on face and body. Water (aqua), glycerin, caprylic/capric triglyceride, glyceryl stearate niacinamide, peg-100 stearate, avena sativa (oat) leaf/stem extract (avena sativa leaf/stem extract), benzoic acid, caprylyl glycol, carbomer, cetearyl alcohol, cetearyl glucoside, fragrance (parfum), oenothera biennis (evening primrose) oil (oenothera biennis oil), polyacrylate-13, polyisobutene, polysorbate 20, sodium hydroxide, sorbitan, isostearate tocopherol, tocopheryl acetate.